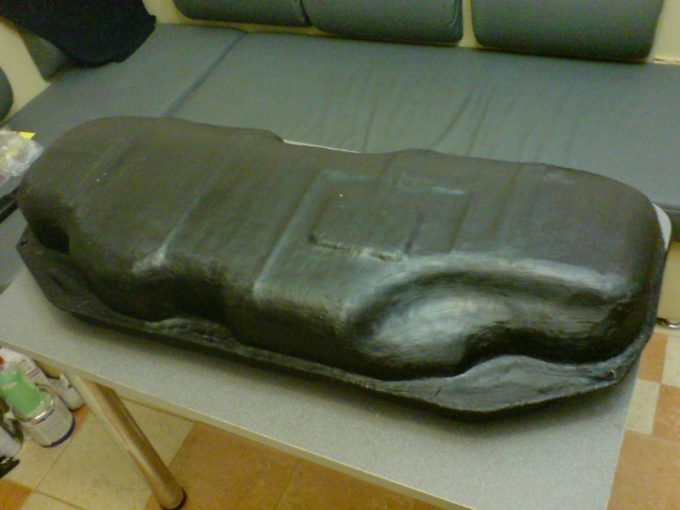 A leak formed in the fuel tank of the vehicle, it is possible to seal with fiberglass and epoxy glue. The reliability of splices is much higher than when using cold welding for bonding. Purchase the necessary materials to perform the work. With this epoxy adhesive two-component prefer domestic. When choosing, consider the advice of the seller and the instructions on the package. Find the location of the leak on the tank. If it is located in an inaccessible place, remove the tank, carefully dry it. The place of gluing sand grinding paper with rough surface (to improve adhesion). Degrease the surface with acetone. The quality of degreasing depends on the quality of bonding! According to the instructions on the package, prepare the epoxy and pour it into a suitable container. If you have to do the gluing on the corners and sides of the tank, give it a thicker consistency. Cut the fiberglass pieces so that their edges protrude from the cracks a few centimeters. Saturate the fiberglass with epoxy glue. Start to stick, applying fiberglass to the repair surface so that no bubbles. The excess resin is removed. To improve the impregnation utrambovyvaya pasted layer fiberglass face hard brushes. Pay special attention to the first layer from its quality will depend largely on the quality of all work performed. Before applying on the first layer subsequent, lightly treat it rough sandpaper. Seal the leak with several layers of fiberglass. Each successive layer should extend beyond the previous 1-2 cm After laying of the next layer wait 15-20 minutes for drying the adhesive. Apply each layer neatly and quickly. The last layer of fiberglass soaked in epoxy resin with added plasticizer (aluminazirconia powder). To do this in a separate container mix the plasticizer and the resin to a mushy consistency. Thoroughly dry the resulting patch during the day. If you want, on top of superimposed patches swipe the putty and painting of the tank. This will improve the reliability of bonding. Before applying putty and enamel surface patch, handle rough sandpaper. Epoxy resin is toxic. Make sure that the workplace is well ventilated. Use protective gloves.